Warfare had a dramatic impact on the landscape. Massive engineering projects displaced earth, removed timber for building material, and erected large structures, all of which altered familiar terrain. 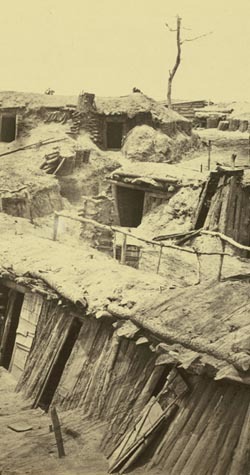 Fort Sedgwick (right) on the Petersburg, Virginia, front, was a notable example of defenses carved out of the earth; it was designed by Major Washington Roebling. Battles brought tent cities, while artillery destroyed trees and rocks. In short, war changed the topography—a reality seen especially well through the eye of Timothy O’Sullivan.